On August 24, 1804, the Lewis and Clark Expedition, traveling up the Missouri River, passed a bluff about 180 to 190 feet high. Clark wrote that it appeared to have been on fire and was still very hot. He also detected signs of coal and what looked like cobalt. Later fur traders frequently noticed dense smoke and fire in this region. In 1839, J. N. Nicollet attempted to prove that these phenomena were not of volcanic origin. Nicollet theorized that the decomposition of beds of iron pyrites in contact with water resulted in a heat capable of igniting other combustible materials. 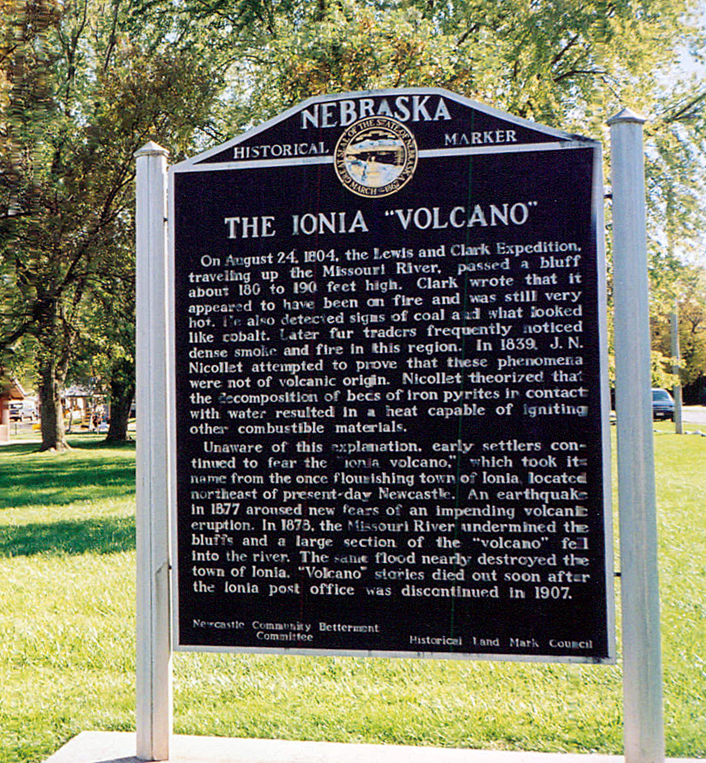 Unaware of this explanation, early settlers continued to fear the "Ionia volcano," which took its name from the once flourishing town of Ionia, located northeast of present-day Newcastle. An earthquake in 1877 aroused new fears of an impending volcanic eruption. In 1878, the Missouri River undermined the bluffs and a large section of the "volcano" fell into the river. The same flood nearly destroyed the town of Ionia. "Volcano" stories died out soon after the Ionia post office was discontinued in 1907. “The Ionia "Volcano",” Explore Nebraska History, accessed April 18, 2019, https://mynehistory.com/items/show/153.